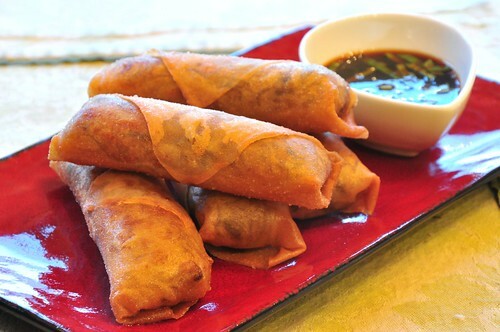 The trickiest thing about the spring rolls isn't the ingredients (shredded napa cabbage, carrots, shiso leaves, bean threads, shallots, garlic, ginger, tamari), how to seal them (1:1 ratio of cornstarch to water, brush the edges & roll tightly) or even the deep-frying (375F for 2-3 minutes). It's where to find wrappers that don't have animal products in them. We haven't yet found them in regular grocery stores -- all the wrappers have egg, milk or whey in the ingredient list. The only place we've found them is at our local Asian grocery store. Even then, you still have to (repeat the vegan mantra): read the ingredient list. 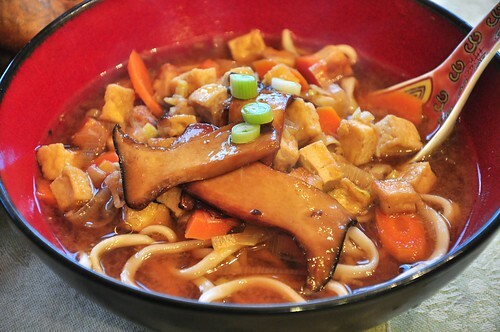 The ramen used shiitake mushroom broth as the base. 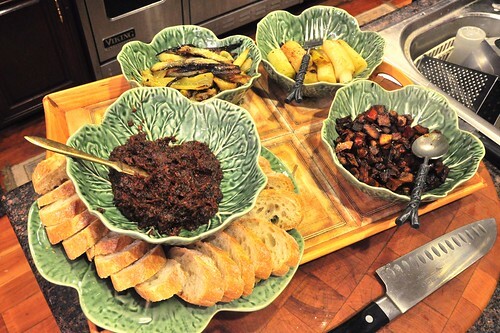 To make that, save the woody stems when you trim shiitake mushrooms until you have about a cup, then pressure cook the stems with eight cups of water for 45 minutes (at 15psi). 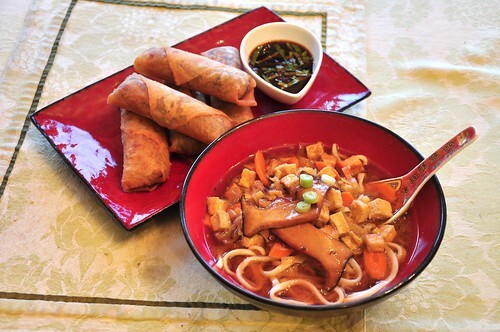 The result is wonderfully aromatic broth that adds an umami depth to the soup. 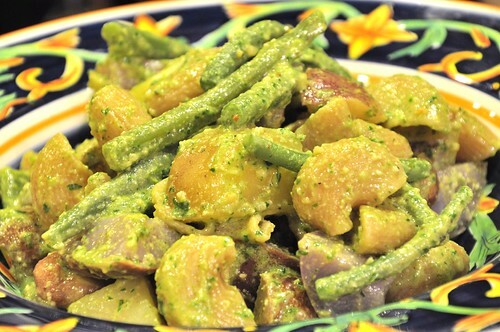 A riff on a Jamie Oliver recipe, with blue & yellow potatoes, pasta and green beans coated with pesto. 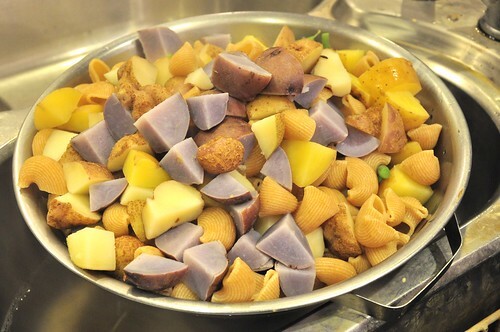 You start with a big pot of boiling water and 15 minutes on the clock -- drop the potatoes in, followed by the pasta with 10 minutes left, and finally the green beans with six minutes to go. The peppers have become our favorite appetizer this year, split in half, seeded, pan-fried in olive oil, splashed with lemon juice and sprinkled with salt at the end -- they all pair very well with a nice glass of sparkling cava from Spain. Otherwise known as: Farmers Market in a bowl with a white wine, Earth Balance & nutritional yeast sauce. 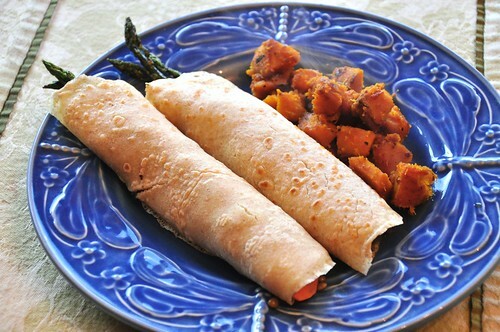 This is another house-favorite meal -- crepes filled with cubed seitan, pressure cooked lentils, onions, carrot, garlic, herbes de provence and grilled asparagus. The stew was then loaded into the crepes from "Vegan with a Vengeance" (which uses basan/chickpea flour). The squash was peeled, cubed and tossed with olive oil, salt, pepper and smoked paprika and roasted at 450F for roughly 15 minutes -- tossing about halfway through cooking. The final time depends on how big you cubed the squash -- these were roughly 3/4". Using a thermometer, heat about 2" of oil in a large pan, pot or wok to 375F. This helps keep the oil temperature from fluctuating too much. Prepare the three (pie) pans for dredging the eggplant. In the first pan, add the salt & pepper to the flour and mix together well. In the second pan whisk together the cornstarch and water to make a slurry. 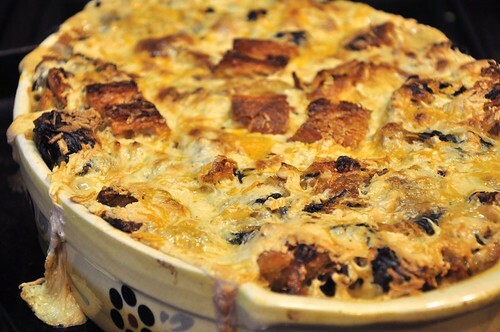 In the third pan add the nutritional yeast and salt & pepper to the bread crumbs and mix to combine. 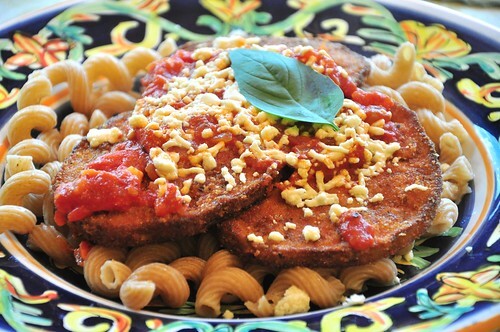 For assembly, take a piece of eggplant and roll it around in the seasoned flour, making sure to coat the sides as well. Next, dip the eggplant in the cornstarch slurry, again making sure to coat the entire piece. Finally, add it to the seasoned breadcrumbs, pressing gently to adhere the breadcrumbs. Repeat until all the eggplant is coated. Fry the eggplant in small batches, making sure you don't crowd the pan too much -- this can make the oil drop in temp, which will take longer to cook and will make the eggplant absorb too much oil and come out soggy. Drain the eggplant on a wire rack or paper towels, or both. 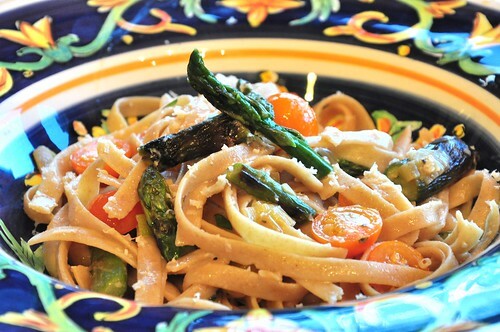 Top with (Daiya) soy cheese and serve over pasta with your favorite tomato sauce.